New York Giants return man Dwayne Harris did it again Sunday with an 80-yard punt return. When the New York Giants signed Dwayne Harris to a five-year, $17.5 million contract during the offseason, many wondered if they overpaid for a return man. 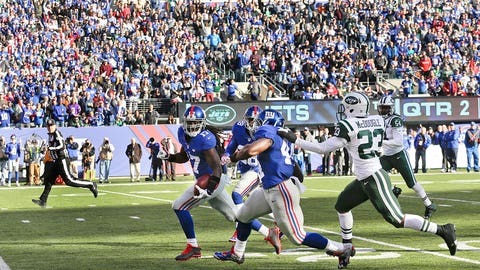 Harris has silenced his doubted by continuing to make plays, and in Sunday’s Week 13 game against the New York Jets, Harris put the Giants on the board in the first quarter with an 80-yard punt return touchdown. Harris weaved in and out of traffic with cutbacks and kept his balance all the way down the field before crossing the goal line.